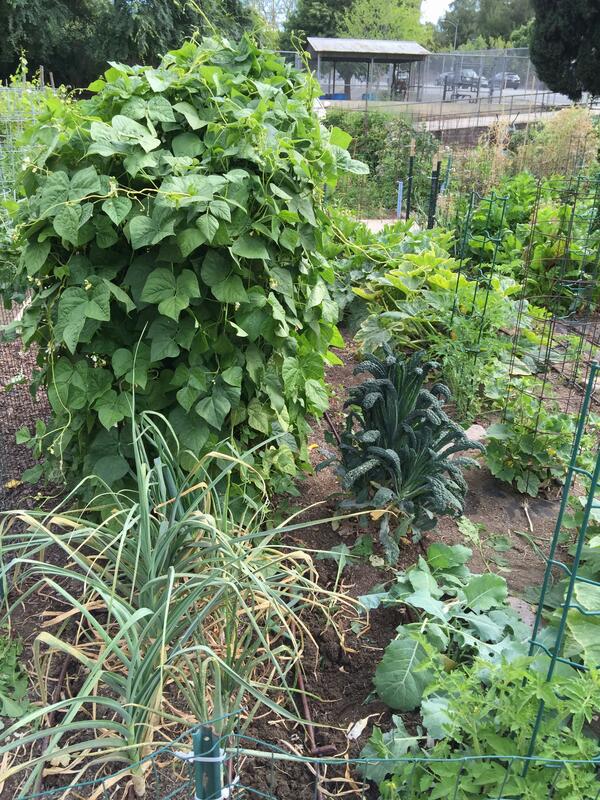 We have grown green beans as Pole Beans and also Bush Beans. 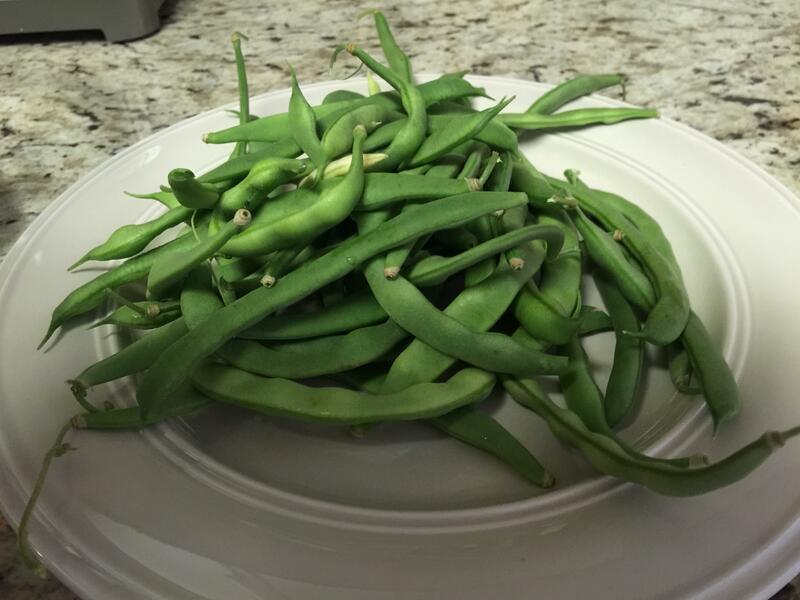 Bush beans grow close to the ground and are usually less than 2 feet tall and normally about 18 inches tall. 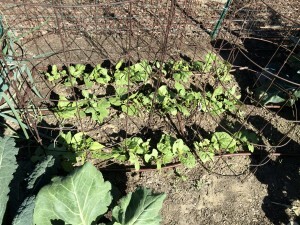 Pole beans on the other hand, will grow about as tall as you make a trellis. We made our trellis about five feet tall out of well used “Tomato” cages. Trellises can be made a variety of ways and with a variety of materials. 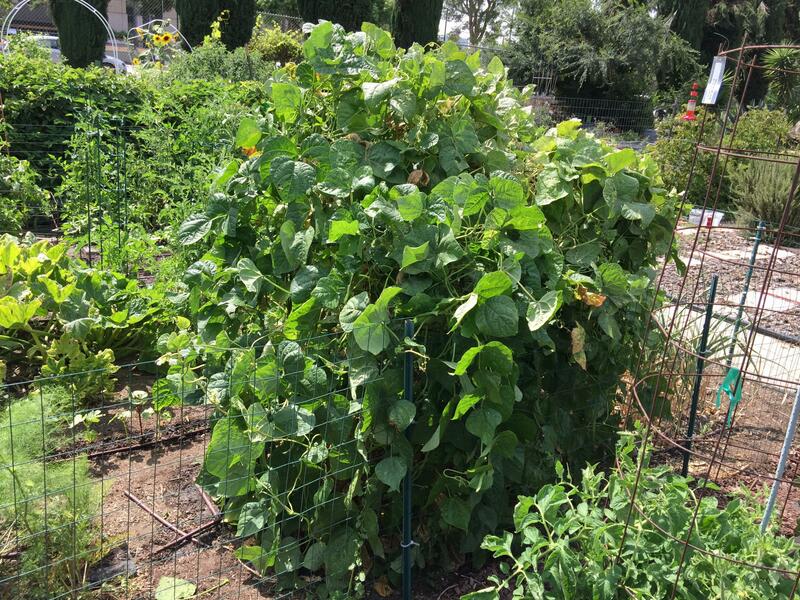 The purpose of the trellis is to give the vines of the pole beans something to climb upwards and to make the beans accessible for picking. Without a trellis, the beans will just grow flat on the ground and defeat the purpose of picking pole bean varieties. 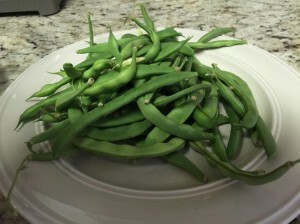 Most “newer” bush bean varieties have been developed to be stingless, but many of the older and very flavorful pole bean varieties have strings. The strings need to be removed when preparing the beans for cooking. The strings in more mature beans have a threadlike texture and do not chew easily when eating the beans. The string will be coarser and more developed as the bean matures and the seeds grow larger. Younger less developed beans will have no strings or a less developed string. When choosing pole bean varieties, read the seed description carefully so you know which varieties have strings and which do not. However, some of the beans with strings have a wonderful flavor and should not be avoided due to this characteristic. Removing the strings just takes a few more minutes during preparation and is well worth the extra time. 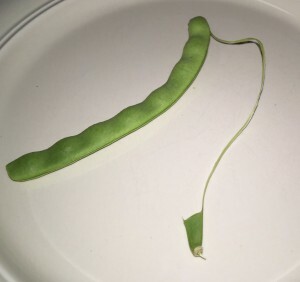 The “String” of a string bean! 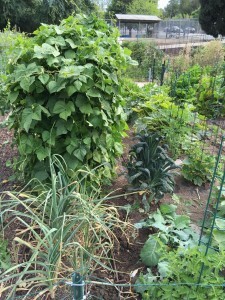 We wanted to grow several pole bean varieties but did not have the space to plant multiple rows of different varieties. Our compromise was to mix the seed of several varieties so the different varieties grew together in a mixed planting. We planted Blue Lake, Kentucky Blue, Kentucky Wonder, and Kentucky Wonder Yellow Wax bean. Some bush and pole bean varieties can be harvested as green beans or as shelled dry beans, if left to fully mature and dry. When planting beans, peas, and other legume crops, we inoculate the seed with rhizobia nitrogen fixing bacteria. Rhizobia bacteria establish themselves in the roots of legumes, forming nodules on the roots of the bean plants. The bacteria fixes nitrogen from the atmosphere and make it available to the plant. The available nitrogen reduces or eliminates the need to fertilize the beans with nitrogen fertilizer. Many soils naturally have this bacteria present at planting, especially if beans, peas, clover, or other legumes have been grown there previously. We plant the beans about an inch deep in the soil and water them immediately. Plant after the danger of frost has past, and the soil has warmed, unless you plan to cover the seed and seedlings with a fabric cover. The beans should start to germinate after about a week. Bean seedlings are susceptible to losses during germination, so we plant the seed close enough to allow for this expected loss. Poor germination, fungal diseases and insects contribute to seedling loss. As germination progresses we thin the seedlings to about 4 inches apart leaving only the strongest plants. After the first set of true leaves develop we apply an insecticide, to combat insects that attack the seedlings. We apply an insecticide periodically as the bean plants grow, if we notice an insect problem. Our plants developed mites this year. We have not yet found a product that is really very good at controlling these pests. The best mite control is achieved with a natural predator. We set our tomato cages over the seedlings once they became established and we had controlled all the weeds. The beans will grow rapidly and will begin to bloom. After bloom, the beans will set and form the beans. 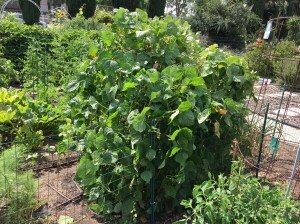 Pole beans will keep blooming and producing, if the plants remain healthy. It helps to keep the plants healthy, if care can be taken during picking to reduce injury to the vines. Keep the beans watered and as pest free as possible for high quality beans. Experience will teach you when to pick the beans. Eat a few as they develop. Usually the beans are picked after they have become big enough for the beans to develop, but prior to the shape of the bean seed becoming too distinct.